Goûtez aux saveurs asiatiques pour lesquelles le quartier chinois de Toronto est célèbre lors de cette tournée gastronomique à Toronto. 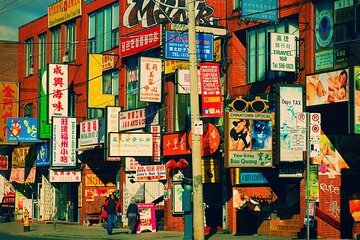 Suivez un guide à travers Chinatown et visitez six restaurants asiatiques authentiques et des stands de nourriture. Dégustez des mets délicieux dans une boulangerie traditionnelle chinoise et des spécialités de la province chinoise de Fukin, et découvrez l’histoire et les traditions des dim sum de Hong Kong. Dégustez des plats de rue dans les marchés asiatiques animés et découvrez où certains des plus grands chefs torontois se procurent leurs ingrédients. The food was different and interesting. One place had huge portions. Disappointed in our tour guide. She kept leaving us to make phone calls and smoke. We loved the cultural history, the tours of the local businesses, and of course the food selections. We are familiar with the cuisine and yet we were surprised and delighted by some of the food choices we ate. Thanks for the great tour. Let me begin by telling you if you are looking for sample portions, this is not that tour. My wife and I recently took this tour with Chef Scott and a new employee sorry cannot recall her name. To begin with both of these individuals know Toronto, where to eat anything and more importantly how to get there. As to the tour you cannot go wrong. We walked within Chinatown and visited several great places including a bakery, several restaurant, a local market. With the inside knowledge of locals who know the neighborhood the owners and Chef's we had so much food we brought home leftovers. We had Din Sum, Dumplings and dishes that we the tour participants help to select so they could eat food we they are more comfortable with, but also allowing the more adventurous in the group to order something they wanted to try. Let me not forget the knowledge they shared about the area and how Chinatown became Chinatown. My wife and I have done food tours around the world and this is one if your a foodie you cannot miss or even if you are just interested in learning more about Toronto while eating good food, this is your tour.. Many food courses, so much good food! Couldn't even eat it all - took lots home in doggie bags. Not too much walking. Felt very comfortable with our tour guide. Although, would like more historical facts about the cuisine. Highly recommended. Informative guide - one restaurant was pretty slow with service.